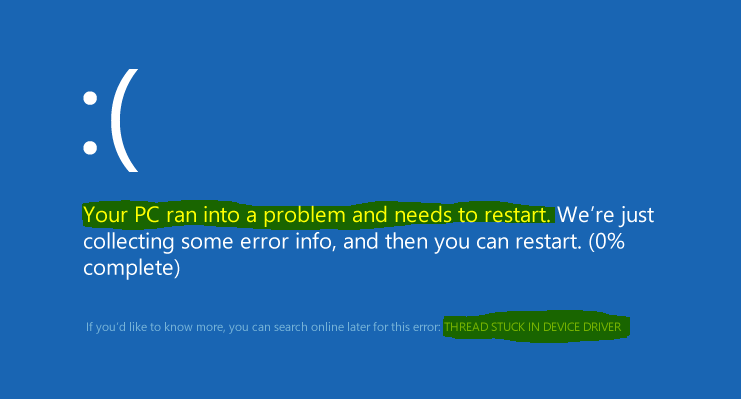 If you are getting the Thread Stuck In Device Driver BSOD error on your Windows 10, here are several methods you can use to get rid of this annoying Windows BSOD error. Last week, I received several emails from users who needed help about a new blue screen of death. Based on what they told me, they were using the computer, and it suddenly turned into a screen with the blue background and the Thread Stuck In Device Driver stop code. Well! According to the stop code, it appears that something goes wrong with one of Windows drivers. I have looked at the minidump files from users, and most are caused by the graphics card and audio drivers. Therefore, updating or reinstalling those drivers will help you get rid of this irritating Windows error. One thing that makes most of the Windows BSOD errors very irritating is that you may not be able to access your computer. Instead, it will be stuck in an endless loop unless you fix the error. In this article, I’m going to share with you a few handy solutions that you can use to diagnose and fix the Thread Stuck In Device Driver BSOD error on your Windows 10 PC. Take a look at them and try them all until your issue is resolved. In most cases, the Thread Stuck In Device Driver occurs because something goes wrong with your drivers, especially the graphics card, or audio driver. To get rid of this problem, you can try to update those devices to the latest versions, or reinstall them. To help you determine the exact cause of this BSOD error, you can use BlueScreenView (or WhoCrashed) to scan for the latest minidump file on your Windows computer, analyze it and show you the result. Based on this, you will know which driver caused this problem. In case you are unable to log into your PC, I would recommend booting into Windows Safe Mode and do all the things there, including analyze and update/reinstall the driver. It’s better to choose “Safe Mode with Networking“, which allows you to access the Internet to download the driver and search for more information if needed. Once you have accessed, press Windows + X, and then select Device Manager. Update Driver Software: To update the driver of your hardware automatically or manually. Uninstall: To uninstall the driver and then you can download the latest version and reinstall it. Once you have done this, reboot your Windows computer and check again if the BSOD error is now gone or persists. Sometimes, corrupted system files on your Windows OS can create an BSOD error, like the Thread Stuck in Device Driver in Windows 10. In order to fix it, you can utilize a built-in feature called System File Checker tool to scan for corrupted files and repair or replace them automatically. Firstly, press Windows + X and then choose Command Prompt (Admin) to launch the Command Prompt application with administrative privilege. In the next step, type: sfc /scannow and press the Enter key to execute the command. After that, the System File Checker tool will start scanning your computer, looking for corrupted files and then repair or replace them if found. An outdated BIOS is also a reason that could lead to the Thread Stuck In Device Driver BSOD error in Windows 10. Therefore, you need to update your BIOS to the latest version. You may think it’s difficult to update your BIOS, but don’t panic, it’s not hard as you thought. Depending on the motherboard you are using, you will need to use different ways to update the BIOS. However, it’s very easy to find the appropriate instruction from the websites of manufacturers, which will help you learn how to do it. For example: Dell, Asus, or Gigabyte. You can find guides for other brands very quickly in Google with the right search terms. Besides all the solutions above, I would recommend cleaning up your Windows computer from dust, and cool it down. In some cases, your hardware may be too hot, especially the graphics card, which may lead to this BSOD error. I hope this post can help you get rid of the Thread Stuck In Device Driver BSOD error in Windows 10. If you have any questions regarding this post, or this BSOD error, do let me know by dropping a comment below.